1. The government has since created two exchange rates in order to stem rampant dollar outflows - essentially devaluing the currency - see story. Only essential goods are permitted to be imported using the original rate. The weaker exchange rate (more expensive dollars - nearly 2x the original rate) is used for everyone else. Black market dollars trade at some 10x the original rate. 2. Oil exports have fallen to the lowest level since 1985. A great deal of the oil the country does export is shipped to China to cover the billions of dollars worth of loans - see story. 3. Government bonds have sold off sharply in January, with long-term rates now above 15%. 4. 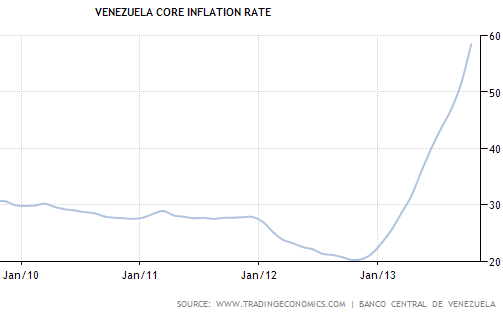 According to the central bank, core inflation is running at close to 60%, although given the shortages it's difficult to measure. 4. Shortages of basic goods persist - see story (quite sad). 5. Dollar debt to the private sector is now over 60% of FX reserves - see story (in Spanish). 6. Foreign reserves are dwindling. 7. 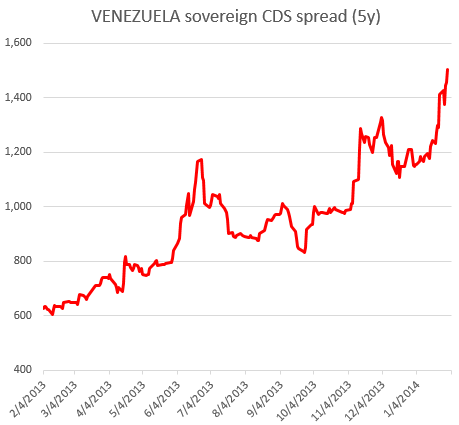 The country's sovereign CDS volume has picked up as traders smell profits, and the spread hit a new high. This is what a crisis in the making looks like.